In case you did not already hear, on Thursday the U.S. Olympic Committee selected Boston -- a.k.a. "The Athens of America" -- as the USA's applicant city for the 2024 Olympic bid process. Titletown" joins a long list of confirmed and potential (and some surprising) bid cities from five continents (Europe, Asia, Africa, Australia and North America). Rome, Paris, Berlin or Hamburg, Saint Petersburg (Russia, not Florida), Istanbul, Doha, Durban or Johannesburg and even Casablanca round out more than a dozen metropoli with 2024 Olympic aspirations. GamesBids.com an informative archive of related news, and the organizing committee has a video series worth a peek. I tuned in to the Team USA morning press conference and media teleconference on Friday with a few questions that weighed on me since the previous afternoon's selection: How does Boston plan to market itself as a domestically famous destination with less recognition outside U.S. borders? What specific points came up in the U.S.O.C. voting? What are more specifics of the bid? As noted in my most recent post, Boston was not my top pick, and skepticism lingered. But most of my initial questions did get answered, and it seemed clear the Boston team plans a transparent and inclusive preparation for the many stages of the bid process. Venue plan and committee member/supporter specifics will start to be unveiled. I like that they announced a series of public meetings and a bit of detail on community engagement. It also impressed me the committee gave a shout-out to Chicago 2016 bid team leader Pat Ryan for some innovations he introduced when The Windy City was a candidate (specifically, a type of insurance policy to prevent public funds getting flushed during the bid process). Finding myself also enjoying the Boston Globe's initial reporting on this hometown news story. A solid opinion piece inviting public discussion set a positive tone for what comes next -- a lot of hard work. Though I'm certainly supportive and now excited about Boston as the USA's applicant city, I do think it has some tough company vying for IOC votes. It would be nice to know more about the in-room discussions the U.S.O.C. board shared with regards to Los Angeles, San Francisco and Washington, D.C., but the spokespersons stuck to the script when Philip Hersh and others inquired with procedural questions also on my mind. Oh, well -- transparency must be back at the Denver airport meeting rooms where those discussions took place. One factoid learned from a brief email exchange with a Globe reporter: Though the current Boston bid team really got started in 2013, Boston's Olympic hopes (or at least the hopes of a handful of locals) go all the way back to the 1970s. I personally recall meeting a Boston 2008 bid team executive for a pin trade at one point. At any rate, glad to see Boston get off on the right foot for the next phase of the city's Olympic pursuits. Images via this link and Boston 2024. 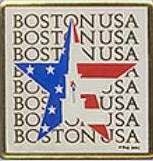 Image of 2008 Boston Olympic bid pin via OlympanArtifacts.com.